Little green and grey men invading a cyber space. Photo by Filip Stojanovski, CC-BY. Ukrainians will head for the polls on Sunday 31 March in what will be the first regular national elections since the country’s 2014 Euromaidan revolution. With its Crimean peninsula still occupied by Russian forces, an ongoing military conflict in eastern Ukraine, and rising activity of far-right groups, the country is a prime target for both domestic and external information influence operations. Ukraine has been in the crossfire of disinformation warfare since 2014, with multiple political actors attempting to disrupt its democratic development. The elections for both the office of the president and parliamentary seats will be a crucial test for Ukraine’s democracy and stability. Much of the action has taken place on Facebook, which is the country’s most popular social network. Despite persistent efforts of civil society and media groups, Facebook has done relatively little to respond to Ukraine’s disinformation problem in the past. But the company changed its tune in January, when it publicly announced that it had taken steps to counter some of these issues. 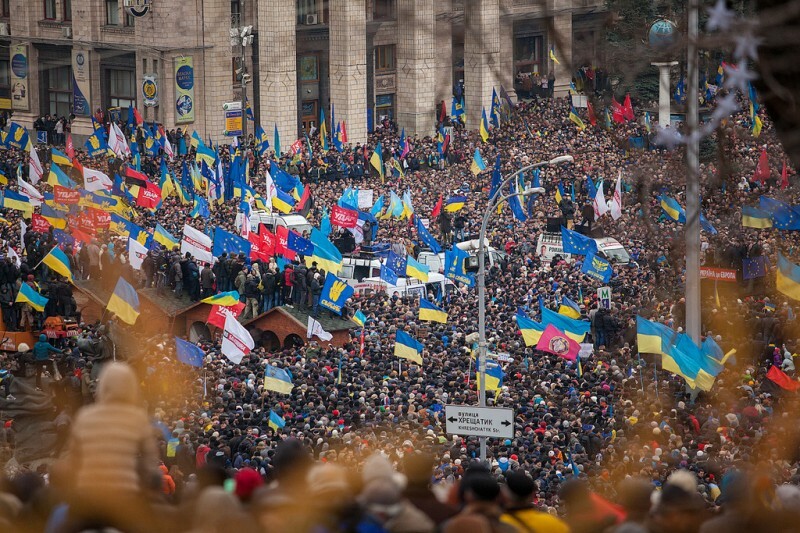 Citing the threat of foreign influence, the company changed its policy towards Ukraine for the election period, banning all political ads purchased from outside of the country (including those concerning politicians, political parties, political slogans and symbols, mobilizing or discouraging voters) and vowing to monitor user behavior more closely. In short order, on January 17, Facebook reported that it had removed multiple pages and accounts on both Facebook and Instagram linked to two malicious operations that originated in Russia and appeared to include Ukrainian users among their main targets. One cluster of 289 pages removed by the company had been active in Central Asia, the Caucasus, the Baltics, and Central and Eastern European countries. Facebook also removed 107 pages and 41 Instagram accounts that had operated specifically in Ukraine. Facebook described their activities as “creating networks of accounts to mislead others about who they were and what they were doing.” The accounts and pages were linked to employees of the Russian state news agency Sputnik, but the individuals behind them had represented themselves as being Ukrainian. According to Facebook, the Ukraine-focused network disseminated local news stories on a variety of topics and spent around US $25,000 on ads. The group’s activities resembled the behavior of Russia’s Internet Research Agency (IRA), which was found to have run online influence operations during 2016 elections in the US. There is ample evidence that Russian state actors and associates have targeted Ukraine with disinformation campaigns going at least as far back as 2014. In 2016, the Ukrainian internet portal Texty.org.ua uncovered a coordinated network of more than 2,000 Facebook profiles linked to a Russian troll farm, which for nearly eight months led an online campaign that sought to topple the Ukrainian government. A more recent study by VoxUkraine reviewed more than nine million tweets linked to the IRA, of which 750,000 related to Ukraine. This disinformation campaign appears to have been sparked by the 2014 Euromaidan revolution and has steadily gained ground through the occupation and annexation of Crimea. The campaign went into overdrive the day after Malaysian flight MH17 crashed in eastern Ukraine. #Euromaidan protesters fill central Kyiv on Dec. 1, 2013. Photo by Alexandra Gnatoush. Used with permission. These and other instances have prompted disinformation researchers at the Oxford Internet Institute to state that Ukraine may be home to “the most globally advanced case of computational propaganda”. Citizen journalists and independent researchers also have played a key role in countering Russian disinformation and alerting both the Ukrainian government and international community about the threats it poses. Despite these efforts and appeals from public officials — including President Poroshenko, who publicly suggested that Facebook open a Ukraine office — Facebook was relatively inactive in responding to the problem until 2019. It appears that Russian meddling in the 2016 US elections and ensuing public pressure (along with pressure from US legislators) have forced Facebook to more actively respond to threats of disinformation, especially when it comes from Russia and targets democratic elections. But while the company’s recent efforts could be a step in the right direction, it may be too little too late. There is only so much Facebook or any other tech platform can do by changing its policies or dedicating more time and labor to monitoring user activity in certain countries. Moreover, some of these policy changes can arguably make the situation worse by driving malicious activity into the shadows. Facebook users were quick to spot several popular pages with seemingly Ukrainian political content that were run from Russia after the network enforced identity and location verification for administrators of popular public pages and verified accounts. In 2018, Ukrainian state security services warned of apparent preparations by Russia to influence upcoming elections by “buying out” administrators of popular Facebook groups in eastern Ukraine and hiring Ukrainian citizens to set up and register news websites domestically. Such persons were offered monetary incentives to disseminate Russian-made content through their social media accounts and web platforms. In cases like these, foreign interference would be much more difficult to detect, let alone expose or counter. Observers at the Ukrainian Election Task Force say that Russia’s goal is not to aid a particular candidate, but rather “to delegitimize the election process altogether”. And if the actions of foreign actors alone were not enough, Ukrainian activists such as political “bot busters” keep uncovering evidence of domestic politicians’ attempts to manipulate public opinion online through the use of inauthentic accounts. In addition, the problematic application of outdated political advertisement regulations to online spaces provides opportunities for further manipulations. Currently, disinformation attacks against Ukraine are as active as ever, and other technology-related incidents are on rise too. Just ten days before elections, the head of Ukraine’s Cyberpolice announced that they have registered increased attacks on Ukraine’s election infrastructure by hacker groups associated with Russia. A few days later, a fake e-mail about election rules was sent on behalf of Ukraine’s Minister of Interior. Alongside state security services working to counter foreign interference during elections, it is vital that activists, researchers and civil society groups keep supporting fact checking, public communications and election observation initiatives on the ground as polling day approaches.